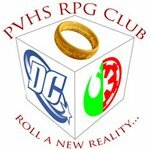 The PVHS RPG Club is a group of like-minded individuals who use their imagination to venture into fictional realms. Newcomers are encouraged to check us out at a learn-to-play convention when we focus on the basics of play and character creation! Listen to the announcements or check the calendar below for these events. During weekday meetings we play tabletop role-playing games set in worlds like Tolkien’s Middle Earth, Star Wars’ New Republic, and the universe of DC Comics. On weekends and holidays members gather to participate in loosely structured battle gaming activities based on the Dagorhir rule set. To participate in battle-gaming activities students and their parents will need to sign a NCSD “Off-Season Sport Conditioning” waiver and students will be expected to learn the rules. Meetings are held Mondays & Fridays from 2:15 - 4:00PM starting in room 220.